A mysterious communication arrived via my agent. It's a letter purporting to be from a lawyer which, as far as I can tell, seems to be ordering me to take down a link to a website, without actually ever giving the actual URL of the website I am meant to have linked to. 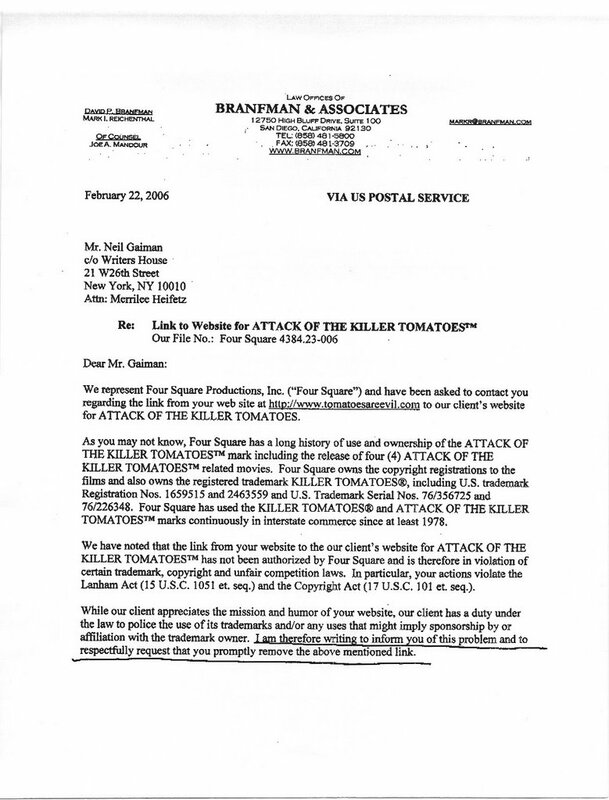 The letter also seems to be suggesting that I own or control or have something to do with a website (http://www.tomatoesareevil.com/) that I manifestly don't, as the simplest websearch or WHOIS check would tell you. 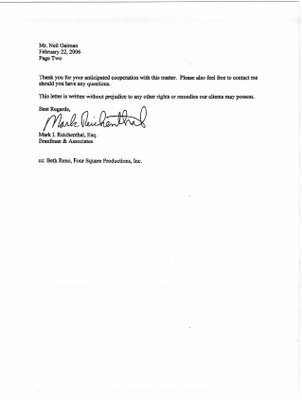 In addition it talks about me infringing the trademark and copyright, by linking, of a mostly forgotten movie. A Google for the web-site of the movie in question (which I vaguely remember as being a bad film that aspired to be "so bad it's good" but never got there) revealed an official website with 77 links to it, none of which, I'm happy to say, according to a Google link-search I did, came from www.neilgaiman.com. Are they real lawyers, the people who wrote this odd letter, the kind who went to law school?Are they actually billing someone for writing these "take down your non-existent link to an unspecified website" letters? Is it an internet prank? 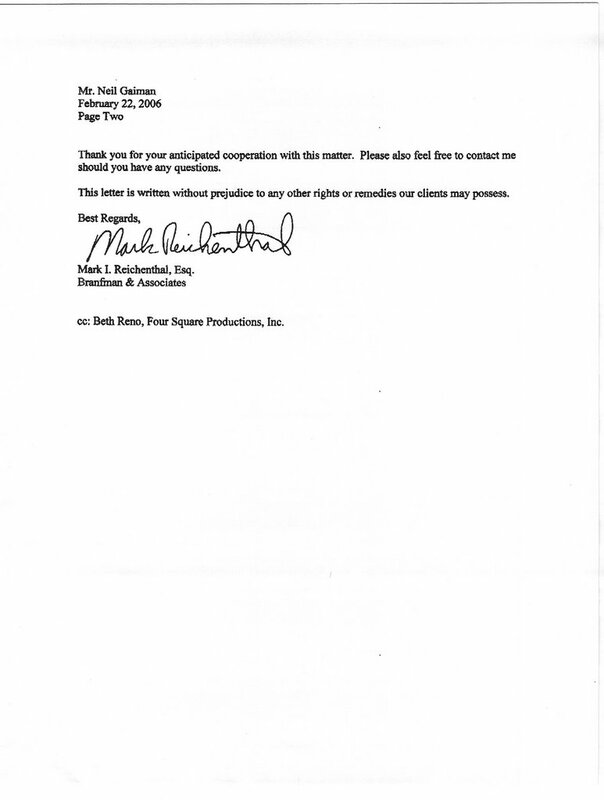 Is there really a "Mark I. Reichenthal", a "Branfman and Associates", a "Beth Reno"? 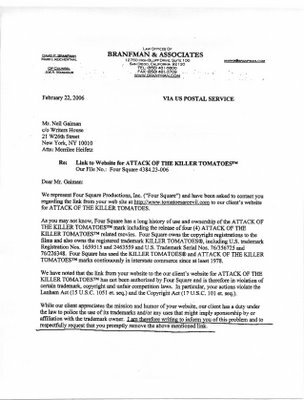 Are they perhaps surrealist lawyers, or cooler than that, Dada lawyers, who have decided to spread artistic confusion and mystery across the web with their "legal letters"? I'm posting the letter here in the hope that one of my readers can shed light on its myriad puzzles for me, and also, if it is indeed, as I would like to think, a Dada art event, that others can bask in its aesthetic glow.